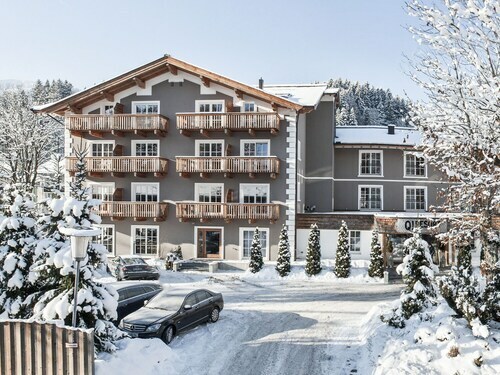 Conveniently near skiing facilities, this Kitzbuehel hotel is located next to a golf course within 3 mi (5 km) of Hahnenkamm Ski Area, Hahnenkamm Cable Car, and Kitzbueheler Horn Cable Car. Kitzbueheler Horn Ski Area and Wildpark Aurach are also within 3 mi (5 km). Conveniently near skiing facilities, this Fieberbrunn hotel is located on a river, within 3 mi (5 km) of Fieberbrunn Cable Car and Buchsteinwand Cable Car, and close to winter sports such as cross-country skiing and skiing lessons. Hochfilzen Biathlon Stadium and Triassic Park are also within 9 mi (15 km). Fieberbrunn Station is 9 minutes by foot. Located near the slopes, this Kitzbuehel hotel is next to a golf course and within a 15-minute walk of Kitzbuehel Tennis Stadium, Kitzbueheler Horn Cable Car, and Kitzbuehel Museum. Casino Kitzbuehel and Hahnenkamm Cable Car are also within 1 mi (2 km). Kitzbühel Station is 23 minutes by foot. Located near the slopes, this Kitzbuehel hotel is within a 15-minute walk of Kitzbueheler Horn Cable Car and Kitzbueheler Horn Ski Area and close to winter sports such as cross-country skiing and snowshoeing. Hahnenkamm Cable Car and Hahnenkamm Ski Area are also within 1 mi (2 km). 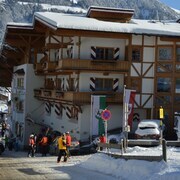 Kitzbühel Station is only a 1-minute walk. 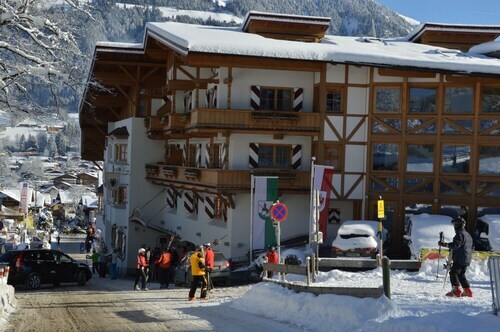 Located near the slopes, this Kitzbuehel hotel is in the mountains and within 1 mi (2 km) of Hahnenkamm Ski Area, Hahnenkamm Cable Car, and Kitzbueheler Horn Cable Car. Kitzbueheler Horn Ski Area and Black Lake are also within 1 mi (2 km). Kitzbühel Station is 23 minutes by foot. 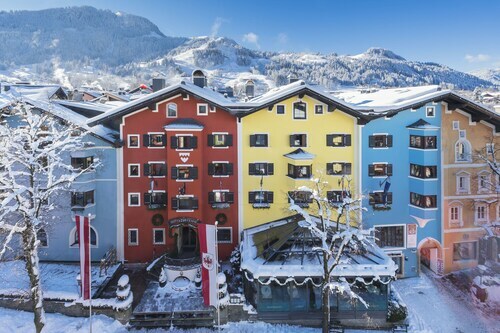 Located in the mountains, this Jochberg hotel offers ski-in/ski-out access within 6 mi (10 km) of Kitzbuehel Tennis Stadium, Hahnenkamm Cable Car, and Hahnenkamm Ski Area. Kitzbueheler Horn Cable Car and Kitzbueheler Horn Ski Area are also within 6 mi (10 km). 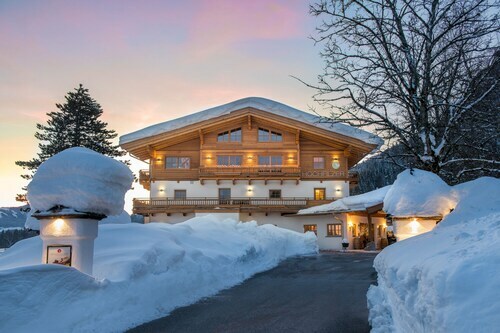 Located in the mountains, this ski-in/ski-out hotel in Kitzbuehel is within a 5-minute walk of Hahnenkamm Ski Area and Hahnenkamm Cable Car and close to winter sports such as cross-country skiing and skiing lessons. Aquarena Kitzbuehel and Kitzbuehel Church are also within 10 minutes. Kitzbühel Station is 18 minutes by foot. How Much is a Hotel Room in Kitzbuehel? 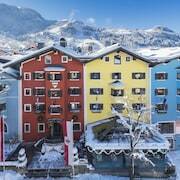 Hotels in Kitzbuehel start at $112 per night. Prices and availability subject to change. Additional terms may apply. When you are looking for quality places to base yourself in Kitzbuehel, you've got plenty of options. 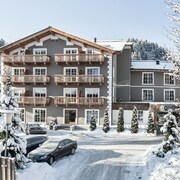 You will find 65 hotel options within easy driving distance of downtown Kitzbuehel on our easy-to-use hotel section. Within 0.6 miles (1 kilometer) of the downtown precinct, readers of Travelocity will find a place to stay at a range of Travelocity-listed rooms, like the Tennerhof Gourmet & Spa de Charme Hotel and Zur Tenne Hotel. Home to 18 Travelocity-listed accommodation options, Kirchberg in Tirol is a hotel precinct that makes a great place to stay. 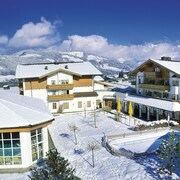 It is 5 miles (9 kilometers) from the heart of Kitzbuehel. 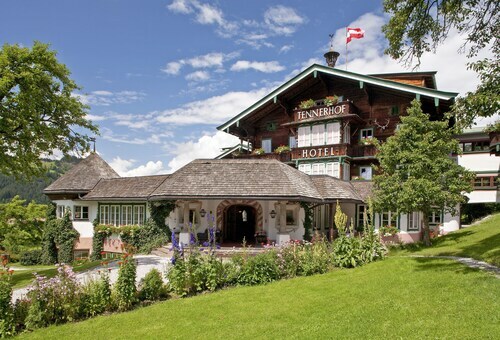 Hotels around here include the Hotel Alpenresidenz Adler and Relais & Châteaux Rosengarten. Students, families and the thrifty can choose from lovely Kitzbuehel hotel and apartment options that won't blow holes in the wallet. The Penzinghof is 3 miles (6 kilometers) from the center of Kitzbuehel, while the KUHOTEL by Rilano is 13 miles (21 kilometers) away. The Gasthof Aschenwald and the Genusslandhotel Hochfilzer are some other budget accommodations that are worth a look. 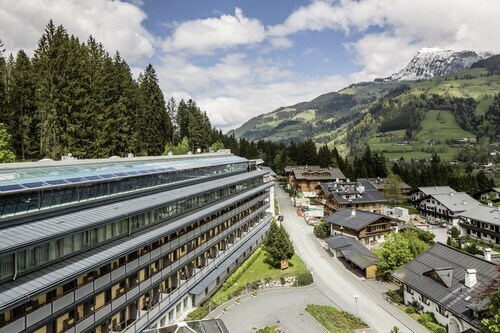 5 miles (7 kilometers) from central Kitzbuehel, you can find the Kempinski Hotel Das Tirol. 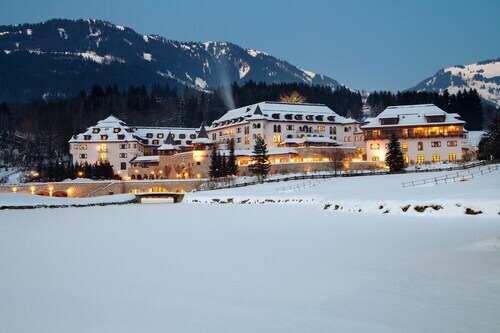 The Grand Tirolia Kitzbühel can be found approximately 2 miles (3 kilometers) away. 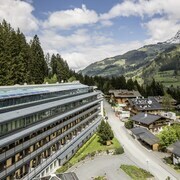 Another option is to investigate the The Alpine Palace New Balance Luxus Resort or the Alpenhotel Saalbach. Planning to get a little bit further afield? Tirol boasts many impressive things to check out. Tirol is known for rivers. The best visitor attractions are castles and old towns. Adventurous travelers might also involve themselves in snowboarding in this part of Austria. Looking for more to do? Spend a few hours seeing Seefelder Spitze and Reither Spitze, which can be found in Seefeld in Tirol, 55 miles (89 kilometers) west of Kitzbuehel. 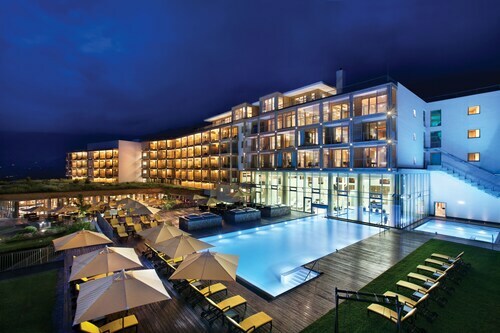 Next time you head to Seefeld in Tirol, check out the Hotel Klosterbraeu and Astoria Relax & Spa Resort. For another option, stay in Lienz, 45 miles (74 kilometers) to the southeast of Kitzbuehel, where you can choose between the Grandhotel Lienz and Vergeiner's Hotel Traube. If you come to Lienz, set aside a little time to check out the Lienz Main Square and Bruck Castle. For those travelers planning on arriving via W.A. Mozart Airport, you might like to book a room at Schloss Mönchstein Hotel, or Hotel Goldener Hirsch, a Luxury Collection Hotel, Salzburg, which are each nearby. Great room with magnificent view and air-condition. Excellent pools and spa. Breakfast was excellent. Staff was very cooperative. Great hotel in any aspect, highly recommended.